28. Pholiota mutans sp. nov.
Illustrations: Text figs. 40-41; Pl. 7d, 8c. Pileus 1-3 cm latus, late convexus, olivaceo-brunneus demum olivaceo griseus vel sordide luteo-olivaceus, viscidus, glaber. Lamellae adnatodecurrentes, convertae demum subdistantes, latae, pallidae, demum subfulvae. Stipes 2.5-4 cm longus, 2-3.5 mm crassus, cavus, deorsum incrasatus sursum albus, sericeus; annulus albus, submembranaceus. Sporae 7-9 x 4-5 µ,. Pleurocystidia desunt. Cheilocystidia 30-62 x 5-7 µ, elongato-clavata, subfilamentosa vel subcapitata. Specimen typicum in Herb. Univ. Mich. conservatum est; legit prope Sharon Hollow, Mich. 27 May 1937. Smith 6225. Pileus 1-3 cm broad, convex, becoming plane or in age with a slightly turned-up margin, "clove-brown" to "olive-brown" at first (olive-brown) becoming "pale olive-buff" on margin, subhygrophanous, fading to "clay-color" or "Saccardo's umber" (dark ochraceous-brown), disc often "Isabella color" for a time, opaque at first, viscid, glabrous except for a slight fibrillose marginal zone, edge often with floccose flecks of veil tissue, becoming striate before fading. Context watery, soft, pale brownish umber, becoming ochraceous; odor earthy, taste mild. Lamellae broadly adnate-decurrent, close or nearly subdistant, (25-30 reach stipe), 3 tiers of lamellulae, moderately broad, (broadest at base), a few forked next to stipe, pallid to whitish at first, crenulate. Stipe 2.5-4 cm long, 2-3.5 mm thick fleshy-watery, hollow, equal or slightly enlarged below, white mycelioid at base, sparsely fibrillose up to the well-formed submembranous, whitish annulus, white and silky pruinose above and below annulus. Spores 7-9 x 4.5-5.5 µ, smooth, apical pore scarcely visible under 1.4-N.A. obj., wall less than 0.2 µ thick but visible as a double line; in face view elliptic, rarely subovate, in profile slightly bean-shaped; in KOH pale ochraceous tawny, in Melzer's reagent pale ochraceous. Basidia 4-spored, 23-30 (37) x 6-7.5 µ, clavate, hyaline in KOH, faintly yellow in Melzer's reagent. Pleurocystidia none. Cheilocystidia 30-62 x 5-7 µ, narrowly clavate, cylindric, or slightly ventricose near the base, sometimes subcapitate, often flexuous or constricted, smooth, content homogeneous (in KOH). Caulocystidia 40-110 x 4-6 (12) µ, similar to pleurocystidia, clavate, subcapitate, to fusoid-ventricose, thin-walled, smooth, content homogenous. Gill trama of parallel hyphae 5-10 µ broad, floccose, cells short and inflated (finally), walls thin, hyaline and smooth, subhymenium cellular and cells indistinctly outlined in KOH but not truly gelatinous. Pileus cutis a thin gelatinous layer of narrow (2-3 µ) hyaline interwoven hyphae with thin smooth walls; hypodermial region not distinct from the context. Context of closely interwoven thin-walled hyaline to yellowish hyphae with inflated cells. Clamp connections present. All hyphae inamyloid. Habit, Habitat, and Distribution: On debris of elm, basswood, and aspen, Michigan and Colorado, May, June and October. Observations: This is a rather anomalous agaric, but is better placed in Pholiota than Tubaria. 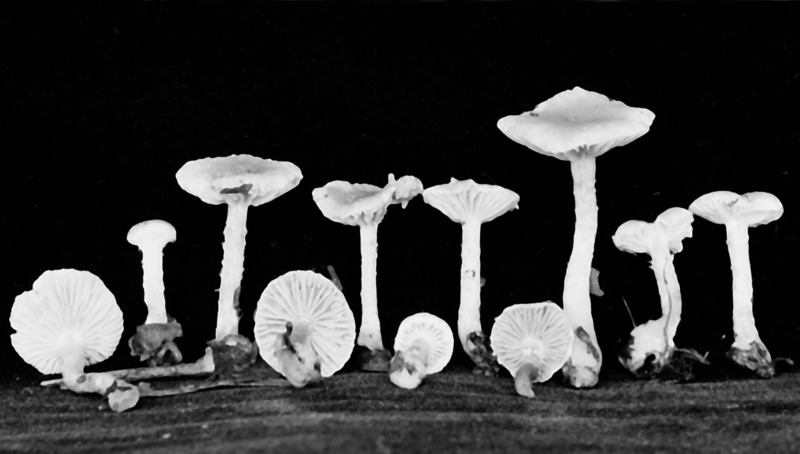 In aspect it is more like Agrocybe than any other genus, but it lacks the diagnostic characters of that genus. It is readily destroyed by insects, as is P. veris, but the spores are not truncate. It is very close to P. striatula but that species differs in wider cheilo- and caulocystidia and in the spores lacking a germ pore. Also, the annulus in P. mutans is typically well-formed. We were at first inclined to place this species in Pholiota oedipus (Cke) P. D. Orton but finally decided against it. There is no doubt that if one maintains a "broad" species concept, one could treat P. oedipus, P. striatula and P. mutans as variants of a single species. However, in the past much confusion has been caused by lumping North American species with European ones before a truly critical comparison has been made of both. 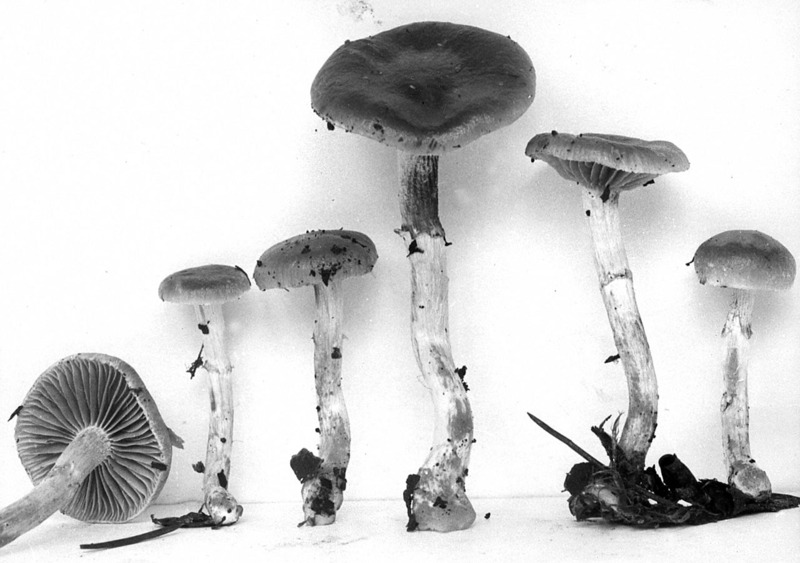 It is difficult for us to visualize how anyone would have ever referred our fungus to Hypholoma. Material Examined: Colorado: Smith 52225; MICHIGAN: Smith 6205, 6225 (type), 6277, 36319, 71531. Washington: Smith 13134, 14134.